The alpha roll is an outdated training technique that involves forcibly rolling a dog onto its back and holding it there by applying pressure to its neck. The move was meant to show the dog who was the leader, but the method has been deemed dangerous and counterproductive for everyone involved. Dog training methods have advanced significantly in the last few decades due to an increase in scientific research into dog behavior and cognition. As a result, many theories that dog owners and trainers once held have been found to fall apart under scientific scrutiny. One such myth is the "alpha roll" as well as the entire "alpha" and dominance theory with dogs and dog training. Mech asserted that previous research was based on captive wolves whose behavior is not indicative of how wolves actually act in the wild where packs function as cooperative family units. The "alpha roll" that wolves do is not an attack and submission hold by a more aggressive wolf, but a voluntary behavior that one wolf might over to another to defuse conflict. The term alpha "falsely implies: a rigid, force-based dominance hierarchy," where none exists and "calling a wolf an alpha is usually no more appropriate than referring to a human parent ... as an alpha." Mech even has asked the published of his original book to cease publication and has worked to inform the scientific and dog training communities about this new understanding of wolves. 2. That wolves display this aggressive alpha behavior. It's important to know when dealing with a dog's behavior is that the most effective and humane way to deal with inappropriate behavior is to work off a clear understanding of the dog in front of you. Bringing in the behaviors of other species, regardless of how closely related they may be, is counterproductive. The alpha roll, a type of aversive training technique, is now mainly deemed dangerous as a training technique and without scientific merit. By performing what seems like an attack to a dog, humans leave themselves vulnerable to a bite to the face, and they lower the trust their dogs have for them. 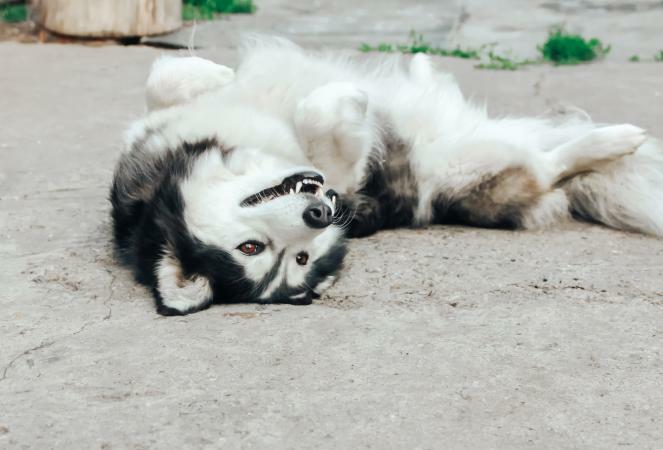 The alpha training technique can have dire consequences for canines and may increase fear, anxiety and aggression. The alpha method and dominance theory is not a good way to build a sound, healthy relationship. A good owner and trainer uses methods based on clear communication and respect for the dog's natural behavior and cognitive abilities. According to a study conducted by the Department of Clinical Studies, School of Veterinary Medicine, at the University of Pennsylvania, aversive training techniques, including the alpha roll, elicited an aggressive response from about one quarter of the dogs on which they were attempted. Veterinary behaviorist Dr. Sophia Yin, DMV, MS also referred to the same study, and she concurred with the conclusion that alpha training techniques can do more harm than good. The American Veterinary Society for Animal Behavior position statement on the use of dominance theory in behavior modification of animals, "emphasizes that the standard of care for veterinarians specializing in behavior is that dominance theory should not be used as a general guide for behavior modification" and "the use of dominance theory to understand human-animal interactions leads to an antagonistic relationship between owners and their pets." The American Animal Hospital Association's Canine and Feline Behavior Management Guidelines (2015) recommends veterinary clinics to not work with or recommend trainers who "explain behavior in terms of "dominance."" AAHA also "opposes training methods that use aversive techniques" which includes alpha rolls. The Association of Professional Dog Trainers published a position statement on dominance and dog training that says, "The APDT's position is that physical or psychological intimidation hinders effective training and damages the relationship between humans and dogs." The International Association of Animal Behavior Consultants published a position statement against the use of dominance theory stating, "Dominance is not a natural order of power between us and our pets, nor is it a healthy or scientifically supported way to approach training and behavior consulting. It certainly doesn't justify the use of punishment in training." The Pet Professional Guild statement on dominance theory in animal training calls it, "an obsolete and aversive method of interacting with animals that has at its foundation incorrect and misinterpreted data which can result in damage to the animal-human relationship and cause behavioral problems in the animal." There are more constructive ways to train a dog. Young puppies benefit from early socialization with people and other dogs. By offering your puppy exposure to a variety of new situations during this crucial development period, he'll learn to adapt easier to other changes that may come along later in life. This is easily accomplished by enrolling your pet in a puppy socialization class at your local dog training facility. Puppies and adult dogs benefit greatly from basic obedience training. A typical beginning obedience course will teach you how to train your dog to common behaviors such as sit, down, stay and coming when called. These classes are not designed to increase your dominance over your pet, but rather to show you how to communicate effectively with your dog. When trained in a positive environment, your dog will develop a deep trust in you and happily follow your cues. This allows you to keep his attention when he may be otherwise distracted, and it could just save his life in a dangerous situation. Even if you have a new puppy that is too young to join a class because of their vaccinations, you can still begin practicing at home. Clicker training is a reward-based dog training method popularized by Karen Pryor that involves using a sound to encourage positive behavior. When clicker training a dog, you use a clicker - a plastic and metal gadget that makes a "click" sound when pressed. The dog learns to recognize that click sound means he did something right (and gets a treat). You teach him this by using the clicker every time the dog performs a positive behavior and then give him a treat. For example, when you tell a dog to "lie down," you hit the clicker at the exact moment the dog lies down to obey your command, and give him a treat as a reward. It's best when first training a dog to keep your training sessions short, such as 10 to 15 minutes at the most. Eventually the food rewards are phased out as your dog learns the behaviors. The clicker training method is a good one for puppies as well as any age of a dog. Current dog training techniques encourage positive reinforcement of good behavior and are generally more effective than punishment methods. Major veterinary and professional animal training organizations recommend reward-based training methods because they can deepen the bond between the owner and the pet, and help create a happy, polite dog. Using positive rewards in dog training will encourage good behavior in a relaxed and safe environment for your pet without the fallout from using more aversive methods. You should never use physical force or hit a dog when trying to discourage a bad behavior. These types of negative methods, like the alpha technique, may accidentally harm the dog or cause the animal to be fearful or distrustful of you. Alpha roll and dominance-based training methods should not be used due to the danger to both the human and the dog involved.